Shopping and travel have been a favorite combination for centuries. Remember Marco Polo? He made history by bringing home those spices and silks from the Orient. Your own goal may be more modest - a new outfit, an addition to a favorite collection; or an interesting gift or souvenir - but the fact remains that here in 21st century America, shopping is the #1 favorite pastime, at home or away. Lexington definitely rises to the occasion in responding to this national passion.Whether you&apos;re a bonafide browsing junkie or just looking for a special souvenir, you&apos;ll find plenty of interesting shops full of fun and fascinating stuff. It isn&apos;t just your imagination that there are shopping centers on virtually every corner here. As the retail hub for a good portion of Kentucky, Lexington actually has a high concentration of retailers for its size. The variety is great, too - Lexington stores range from charming boutiques to mega centers, bargain-priced places to the totally upscale and the classic to the trendy. You can find your favorite national retailers and without looking too hard, are sure to discover locally owned shops that are pure Kentucky. Here&apos;s an "insider&apos;s guide" to get you started. We&apos;ve focused on making you aware of a variety of interesting local shops, showcasing the one-of-a-kind places you&apos;ll find only in Lexington and directing you to the high-volume shopping areas. Bluegrass Note: How about hours? Malls and large stores are open seven days a week. Many specialty shops are closed Sundays and evenings. Hours may also vary seasonally, with extended shopping during the holiday season. Call to verify hours. For many shoppers - and especially if there&apos;s a teenager in your group - the essential shopping question is: "Where&apos;s the mall?" Lexington has several indoor malls and large shopping areas that are a good bet if you&apos;re looking for concentrated volume and variety. The big one: The main mall in town is Fayette Mall , and it&apos;s a big one - more than 120 stores covering about 1.1 million square feet. It&apos;s the largest mall in Kentucky. Along with department stores Macy&apos;s, Dillard&apos;s, and JC Penney, you&apos;ll find many of the best-known specialty shop names in America - Banana Republic, The Gap, Victoria&apos;s Secret, J. Crew, The Disney Store, Williams-Sonoma, Abercrombie & Fitch, and many more - plus restaurants including BJ&apos;s Restaurant and Brewhouse, Cheesecake Factory and Olive Garden. There&apos;s a large food court as well with more than 25 eateries. And if you have a non-shopper in the group, he or she can pass the time by catching a movie at one of the sixteen theaters at Cinemark Fayette Mall. Fayette Mall is located at 3401 Nicholasville Road, just south of New Circle Road. This is the heart of a retail corridor. Several other shopping centers and discount stores are nearby. The new one: And now for something completely different: The Summit at Fritz Farm. Across from Fayette Mall, at the corner of Nicholasville Road and Man o&apos; War Boulevard, stores and restaurants are opening throughout 2018. This new development is a vast collection of upscale shops and eateries and celebrates, by design, the rich heritage of Lexington. A sampling of tenants: Anthropologie, Arhaus, Ariat, Brooks Brothers, Frye, Fabletics, Draper James, Pottery Barn, Scout & Molly&apos;s, BONOBOS. Books to briefcases to food and fashion: The centerpiece of Lexington Green, just north of Fayette Mall, is Joseph-Beth Booksellers, one of the region&apos;s largest independent bookstores. A large, attractive store with CDs, gifts, and a good restaurant as well as books, "Jo-Beth" is a favorite see-and-be-seen spot for Central Kentuckians. Lexington Green is also home to lululemon athletica, LOFT, Chico&apos;s, White House Black Market, Charming Charlie and more, plus the locally owned specialty store Artique. Bluegrass Note: Lexington, like other cities across the United States, has become home to numerous mega-center shopping zones in recent years. Not malls, but sprawling collections of strip centers and discounters, these are a shopping phenomenon you either love or hate. Lexingtonians are split in feelings about Hamburg Place, located off Man o&apos;War Blvd. near I-75. The entry and parking areas are maze-like, but shoppers brave them in droves to take in the array of shops ranging from big discounters Target, Meijer, and At Home to teen haven Old Navy to the immense pet-and-tack shop PetSmart. Specialty clothing and gift shops create an upscale mood at The Shops at Lexington Center and The Square, two areas connected by covered pedways in the heart of downtown Lexington. The Shops at Lexington Center are located adjacent to the Rupp Arena/Heritage Hall convention center complex. Stop in for tasty chocolates at Old Kentucky Chocolates, or one of the shops offering UK logo wear and Kentucky souvenirs. Across Main Street at The Square, specialty shopping continues with Sincerely Yours (a gift and collectible shop), artist&apos;s studios, Urban Outfitters and Main Cross Gallery. Take home a true Kentucky original from Savane Silver at the corner of Short and Broadway. Designer pieces include unique jewelry made from Kentucky agate. Agate, a form of quartz, is only found in six counties in Kentucky. Just a little further north on Broadway, you can find everything you need for your next black tie event at Miss Priss. There&apos;s a wide selection of formal wear including pageant and prom gowns. If you need a lesson on how to dress like a Lexington gentleman, head over to Howard & Miller at 400 Old Vine Street. They&apos;ll show you how to be trendy, classy and Southern all in one outfit. Women&apos;s clothing boutiques in Lexington suit a wide range of personal tastes - from furry to funky. Shop around a little, and you just may decide that Lexington should be called the "clothes-horse capital of the world." If fur&apos;s your thing, be sure to visit embry&apos;s, 3361 Tates Creek Road. A full-service furrier in business since 1904, embry&apos;s carries a beautiful selection of fine furs, along with apparel by ESCADA, Joseph Ribkoff, NYDJ and others. There&apos;s always something tempting on display in the windows of Bella Rose, 126 West Maxwell Street (between downtown and the University of Kentucky campus). This women&apos;s boutique offers fashions for all occasions, casual to formal, and carries chic lines sich as Nicole Miller, Shochanna and Milly. Tucked away at 867 East High Street in Chevy Chase is AJ&apos;s Casuals, a little boutique that can drop some big names - like Trina Turk, DVF, Tori Burch and Tibi. Dazzling designs and friendly service are the shop&apos;s hallmarks. Hopscotch, on Clay Avenue, offers classic children&apos;s apparel for newborns through preteens, plus a charming assortment of wooden toys and stuffed animals. Brand names like Gretchen Scott, Jude Connally and Nick + Zoe - along with great service that even includes a space with toys for the kids so mom can shop - have won Cotton Patch a loyal following of local customers. The boutique carries casual, career, and tennis wear, and is located in the Lansdowne Shoppes shopping center at 3367 Tates Creek Road. If you are a fan of Monkee&apos;s, you&apos;ll be happy to discover that we have one in Lexington at 116 Clay Avenue. If your tastes turn more to the fun-and-funkier end of the fashion spectrum, check out The Pink Spider at 507 East High. Hip clothes and unique accessories make for a colorful browsing experience. This is a "boutique with a bite." Bluegrass Note: Gift stores at some of Lexington&apos;s favorite tourist attractions are worth a trip in themselves. The Kentucky Horse Park Gift Shop, located in the park&apos;s Visitor Center, 4089 Iron Works Pike, has everything for the horse lover, from prints and original oils to jewelry and Kentucky souvenirs. Many items are Kentucky-made. Another haven for equine-themed items is The Keeneland Shop at Keeneland, which carries products ranging from jewelry to kid-stuff. There&apos;s also a great selection of Keeneland shirts, hats, and jackets. Kentucky julep cups, watercolors, and regional cookbooks can be found at the Museum Shop at Ashland, the Henry Clay Estate, along with books and items relating to Henry Clay. A visit to Shaker Village (about 40-minutes from Lexington via US 68) isn&apos;t complete without browsing the lovely gift shop, with its handmade Shaker-style furniture and mirrors, Kentucky-made pottery; and handwoven textiles. Several Lexington clothing stores specialize in high fashion at low prices. TJMaxx at Regency Center, 2311 Nicholasville Road, attracts shoppers on the prowl for designer clothing and shoes as well as houseware items. Other designer discounters include Stein Mart in the Woodhill Shopping Center, 1555 East New Circle Road, with tempting discounts on clothes and accessories for the whole family, and two locations of Marshall&apos;s, one at Hamburg Place and one at 240 East Brannon Road. An upscale consignment shop, Sassy Fox, 3101 Richmond Road, carries women&apos;s clothing, both casual and formal. Stephen Lawrence, Ltd., 1200 South Broadway, and 183 Moore Drive, features top label fashions for women, men, and children, plus jewelry and accessories. For teens, there is a Plato&apos;s Closet at 2220 Nicholasville Road. As you might imagine, the region has a consignment shop for elegant equestrian apparel. It is located in nearby Midway: Commotion Consignment Riding Apparel. (859) 552-5983. Could there be a more intriguing name than The Black Market? Don&apos;t worry; nothing illegal&apos;s going on, just a lot that&apos;s unusual. At this downtown shop at 516 East High Street, you&apos;ll find interesting sterling silver jewelry, candles, incense, bath products, even clothing items at great prices. There&apos;s a whole room devoted to shoes! Nearby, you&apos;ll find Lucia&apos;s World Emporium, on North Ashland. They search the world looking for ethical fair trade brands to bring you jewelry, clothing (including organic active wear), gifts, pottery, art work and home decor. Bluegrass Note: Lexington&apos;s famous big blue horse, known as "Big Lex," is so popular, the Lexington Visitors Center stocks merchandise related to the legendary blue horse. And a variety of great t-shirts! Maybe you&apos;ll find what you&apos;re looking for in sQecial media. This little shop at the edge of the University of Kentucky campus has been in business for over 40 years. Oddities, tapestries, moonstones, grooming products for your beard, books and imaginative gifts abound. And don&apos;t overlook Kentucky for Kentucky, 720 Bryan Avenue, near downtown. The focus is on promoting the people, places, and products of Kentucky. Never boring, you&apos;ll find wild-and-crazy, often irreverant stuff to remind you of your Kentucky visit. Peggy&apos;s Gifts & Accessories, 112 Clay Avenue, is packed with hand-picked goodies you won&apos;t find elsewhere. Owner Peggy Queen picks fabulous sterling jewelry, special baby and wedding gifts and unique home accessories. Elegant, whimsical, practical, fun... it takes a lot of different words to describe what you&apos;ll find at Artique. From some serious jewelry and beautiful hand-blown glass to hilarious folk art "yardbirds," Artique, at Lexington Green, carries handmade arts and crafts made by artisans across the United States. The Gift Box, at 3330 Partner Place, is packed full of Candleberry candles,picture frames, jewelry and purses. Enjoy browsing before or after you have tea or lunch in the adjacent tea room. Sincerely Yours downtown at The Square, near the Lexington Visitors Center, has a delightful mixture of hard-to-categorize items that you just can&apos;t live without. If you like your UK logo wear emblazoned with rhinestones...this is the place! Dress your bed, bath and table at Linens Limited, 114 Clay Avenue. They carry the finest hand-embroidered linens from Portugal & Madeira, Juliska ceramics and glass, Arte Italica pewter and several prestigious table top and gift lines. This is the only place in Kentucky to find candles by Cire Trudon , the oldest candle company in the world. More "table top couture" can be found at L.V. Harkness, 531 West Short Street. This shop offers an intriguing mix of fine dinnerware and crystal, and personal accessories. Shop owner Meg Jewett, who also owns Walnut Hall horse farm, even commissioned Europe&apos;s oldest porcelain manufacturer, Meissen, to create a place setting called "Bluegrass Series." It costs $1,894 per five-piece place setting, but, hey, no charge for looking. And tucked amid the pricey stuff are more modestly-priced finds. The shop is next door to the Greentree Tea Room, a lovely setting for a special lunch. You could browse for hours at Cowgirl Attic, 1535 Delaware Avenue, purveyor of reclaimed urban artifacts. You&apos;ll find furniture, garden relics, antiques, lighting and beautiful things for your house. The outside area is full of garden planters, trellis, arches and sculpture for your garden back home. You just never know what you&apos;ll find at Scout Antique & Modern, 935 Liberty Road. A constantly changing inventory includes furniture new and old. But the best things are the accessories; unique items in all price ranges. Note: Lexington has oodles of antique shops.... so many that they have their own feature story. Check with VisitLEX for additional information. Bluegrass Note: Here&apos;s the ultimate souvenir- your very own race horse. Lexington&apos;s Keeneland holds major Thoroughbred sales in April, September, November, and January. It&apos;s not just for royalty: Prices range anywhere from the thousands to the millions. Of course, buying the horse is just the beginning. Then you have to feed it and train it! Looking for some very special baubles? Shelia Bayes Fine Jewelers, located at The Summit at Fritz Farm, is a local favorite for top designer jewelry from around the world. Custom-design pieces are created by the store&apos;s own award-winning designers. Also at The Summit, the Meg C Jewelry Gallery showcases their handmade, whimsical and contemporary jewelry. They can also custom design a piece to your specifications. For generations Farmer&apos;s Jewelry has provided Kentucky families with quality fine jewelry. The shop is at 821 Euclid Avenue, and if you find yourself in need of some jewelry repair while visiting Lexington, give them a call at (859) 266-6241. St. John and Myers at 198 Moore Drive specializes in antique, period and estate jewelry as well as newly crafted items. Lexington even has its own category of shops. Just call them "Blue-tiques." These are entire stores devoted to items emblazoned with University of Kentucky sports logos. Perhaps the premier Blue-tique is Kentucky Korner, with two locations, in the Shops at Lexington Center downtown, and at Fayette Mall. Here you&apos;ll find everything imaginable - T-shirts, sweatshirts, pajamas, hats, keychains, even trash cans - all kinds of "True Blue" gear and gifts coveted by fans of the University. Another great source is Wildcat Wearhouse, with four locations: 353 Southland Drive, 415 South Broadway, 2300 Sir Barton Way and in Fayette Mall. Well, there it is, enough shopping to keep you busy for days. In Lexington, you&apos;re sure to find stores worth writing home about. When you are at the visitors center, be sure to pick up a (free) unique postcard and do just that! 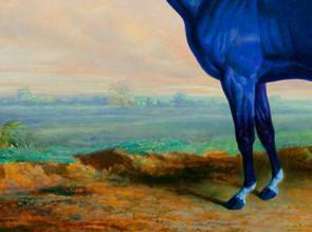 It features Lexington&apos;s famous "blue horse." For more information, contact the Lexington Visitors Center at (800) 845-3959.